Matt brings a wealth of knowledge and experience to every program that he is part of. He has paddled and worked in Canada, Australia, New Zealand, Costa Rica, and Chile. 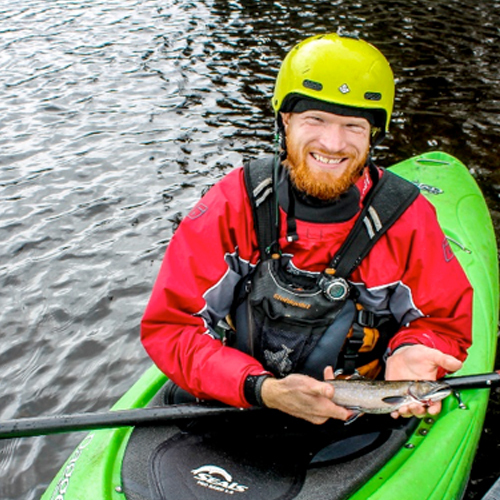 He is an expert kayaker, an experienced canoe tripper and raft guide. Matt has organized and led multiple expeditions. He has worked on rivers for several organizations including YMCA Camps, the Outdoor Education Group, and the National Outdoor Leadership School (NOLS). Matt currently has a full time job as director of an outdoor centre. However, he makes time to join us to teach several rescue courses every spring and summer, and has guided with us on the Magpie. The best way to get insight into Matt is his car. From the outside, his brown caravan looks a little rough—like a classic road trip vehicle. Once inside, you get a window into his style and passions: it is meticulously organized and packed with gear. Matt spends a lot of his free time climbing, boating, and travelling to spectacular places. Matt has a clear and concise teaching style, excellent sense of humor and is excited about the opportunity to share his knowledge and passion with others.